Investigation of the effect of the Fe abiotic stress on the germination rate, iron accumulation, root and shoot elongation of wheat (Triticum aestivum) was carried out. The grains were exposed to different experimental concentrations of ferrous sulfate (FeSO4) (0–15 mM). The effect of the treatment on the shoot and root elongation of the seeds were reported. There is a linear relationship between the treatment and the inhibition of shoot elongation. The half-inhibition dose (ID50) of FeSO4 on inhibition of shoot elongation was 7.3 mM. Each treatment groups (3–15 mM) were used to fortify the wheat flour at 0.1 mg Fe/g. 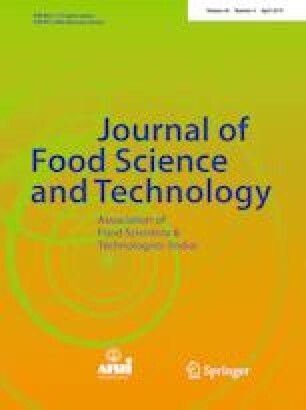 The effect of fortification on rheology (farinograph, extensograph, and amylograph), quality of pasta and iron bioavailability was studied. The pasta cooking properties, texture and sensory properties of 12 and 15 mM composite pasta were equally acceptable as wheat without fortification, or NaFeEDTA fortified pasta. The iron dialysability of 3–15 mM composite pasta was similar to the NaFeEDTA fortified pasta. The iron bioavailability (in vivo) of 15 mM group based pasta was evaluated in the anemic rats. The pasta at 4% (Fe 0.026 mg/g) in iron-deficient diet fed to anemic rats for 2 weeks showed percentage iron absorption (PIA) and hemoglobin regeneration efficiency (HRE) of 85.3% and 44.4% respectively which is higher than the NaFeEDTA. In conclusion, iron-fortified pasta is the promising food fortificant with more iron bioavailability in the prevention of iron deficiency anemia. The authors would like to express their sincere thanks for the financial support from the INSPIRE programme (IF131140), Department of Science and Technology, Government of India. The institutional ethical committee approved all the experimental procedures involved in the presented experiments.